“The key to success is hard work,” Seymour Holtzman said. “And you have to listen and learn all the time”. 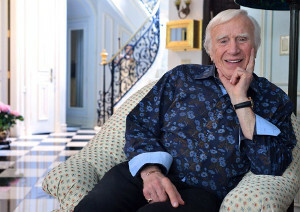 At 78, Palm Beacher Seymour Holtzman has not lost his youthful sense of adventure, especially when it comes to business opportunities and investments. A self-proclaimed “serial entrepreneur” Holtzman has been involved in several businesses since his 20s, when he operated an advertising and printing enterprise in his home town of Wilkes-Barre, Pa.
“Some of them were successful,” he said with a slight twinkle in his eye. Currently, Holtzman is the chairman of, and largest shareholder in, DXL Group, which owns and operates retail stores catering to the big and tall men’s market. He also owns, with his wife Evelyn, Internet retailer HomeClick.com; C.D. Peacock; a Chicago area jewelry store, with four locations; and he recently opened the Rolex Boutique Luxury Swiss in Miami.s Design District. He also keeps current with market trends. For instance, he was convinced, in the mid-1990s, that the Internet would be a lucrative and expanding place for retailers to set up shop. Holtzman saw the potential for a successful venture when he pursued a deal with Rolex to open one of two licensed watch boutiques in Florida. Having been a Rolex dealer for more than 20 years via C.D. Peacock, Holtzman was a familiar and trusted figure to the prestigious Swiss watchmaker. “C.D. Peacock is very financially stable, and I’m a known entity to Rolex,” Holtzman said, explaining that he was confident about being selected to operate the Miami boutique. The company has reduced its distribution points by half over the past several years. “And I can’t resist an opportunity,” he said. “Seymour is a world-renowned businessman with a lifelong passion for fine jewelry, timepieces and art,” said Victor Herrera, vice president of new-store development for Rolex Boutique Luxury Swiss LLC. 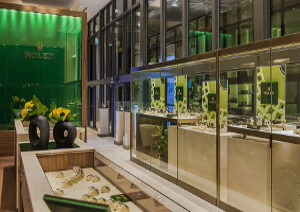 The sleek 1,400-square-foot boutique, which sells only Rolex products, cost Holtzman more than $5 million to open. He believes it is money well spent, as the store is stocked with an “unbelievable assortment of watches”. Due to limited distribution, some of them cannot be found at other Rolex dealers. The boutique is “a simple concept, which is something I also like,” Holtzman said. He is in daily contact with the store, to which he makes weekly trips in order to keep an eye on his investment. But he is always happy to return to the island, where he has lived for the past 11 years. “We come from a small town and like that quality about Palm Beach — it feels like home,” he said.